A few months ago we announced our Refer-A-Friend program. This simple system lets you earn money for simply telling friends about the value of Bondora. The program is available to all our investors. Anyone who joins with your custom referral link and becomes an investor on our site, gets 5 EUR added to their account for their first investment. When you refer them, you get 5% of everything they have invested over the first 30 days. You get paid inside 20 business days after their first 30 days on the site. As long as your friend invests at least 10 EUR and follows our terms and conditions that all investors have to follow, the money is yours. For the first time since launching the program we’re proud to share the results of those who have supplemented their earnings with referral bonus cash. Starting from late September, 137 investors have been participating in the personal referral program. 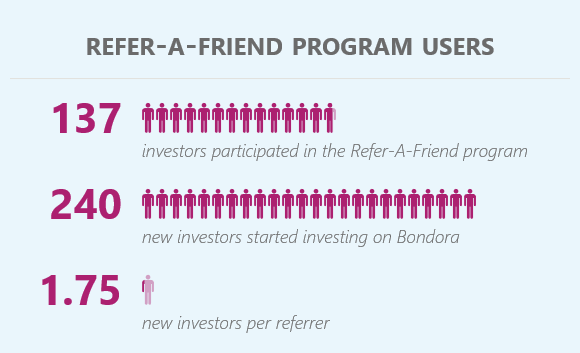 These 137 investors have invited additional 240 investors to Bondora, which makes 1,75 new investors per referrer. 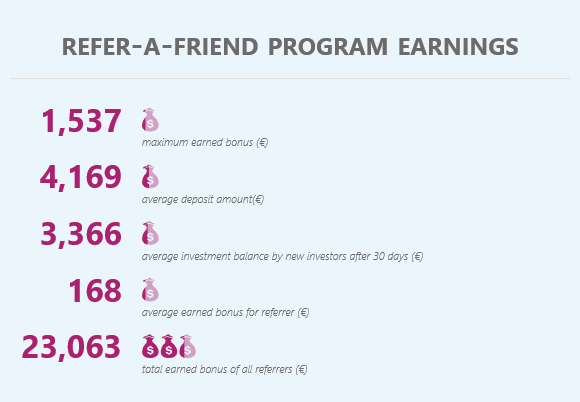 The average earned bonus was €168 and our highest earned bonus by referring investor to date is €1,534. Bondora has paid out a total bonus of €23,063 to our users. To date the total investment balance of our referrals has reached €461,263. More than 130 of our users have discovered how easy it is to send a quick message to a friend. When you invite someone to seek higher investment returns with Bondora, you’re sharing the value of your experience while earning easy income. The more people you refer the more you earn!